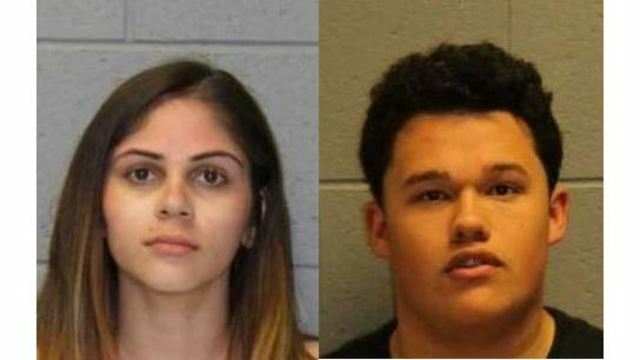 NAUGATUCK, Conn. (WTNH) - Four people are facing charges after a motor vehicle stop was conducted in Naugatuck on Saturday. According to officials, around 6:00 p.m., a stop was conducted on Rubber Avenue. Police said there were alcoholic drinks inside of the vehicle and that none of the occupants were of the legal age to possess them. Authorities then conducted a search and found marijuana, open bottles of beer, knives and a stolen handgun. Officers charged 19-year-old Raymond Williams, 19-year-old Hypatia Areizaga, and two juveniles. Williams is facing several charges, including stealing a firearm and risk of injury to a minor. Areizaga was charged with risk of injury to a minor, serving liquor to a minor and possessing liquor by a minor. The two juveniles also faced charges, including possessing liquor by a minor. Williams was held on a $150,000 surety bond and was arraigned in court on Monday. Areizaga was released on a written promise to appear in court on April 25th. The two juveniles were released to the custody of a parent and will appear in juvenile court at a later date.